The Israeli army and police detained, on Sunday at night, five Palestinians from Jerusalem for capturing the Jerusalem shooting attack on film, while allegedly showing support for the attack by “shouting Allahu Akbar.” The Police have so far detained 21 Palestinians since the attack took place. In a statement, the Israeli police said that the Internal Security Minister Gilad Erdan has instructed the police and the army to act against any activity, including statements, that show any sort of support for the shooting, or praise the shooter, Misbah Abu Sbeih, 39. Abu Sbeih was killed after shooting to death an Israeli police officer, identified as First Sgt. Yosef Kirme, 30, and a woman, identified as Levanah Malichi, 60. 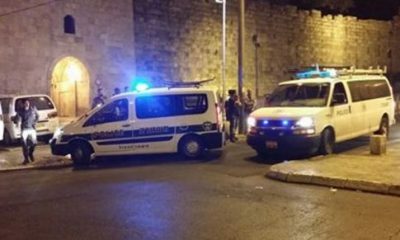 According to the Police, several Palestinians were arrested after distributing sweets to the public, celebrating the death of the two Israelis. The Israeli police also arrested those who demanded that store owners shut down in mourning for the Palestinian. Lawyer Mofeed al-Hajj, of the Jerusalem office of the Palestinian Prisoners Society (PPS) said the police and army abducted five Palestinians who managed to film the attack, or parts of it, and published the videos on social media outlets. Two of those arrested shut down their stores in mourning for the Palestinian who was killed after carrying out the shooting attack. He said the detained Palestinians have been identified as Ibrahim Suleiman Sandouqa, his brother Mo’taz, Ramzi Mohammad al-Jo’ba, Mohammad Hani Emhalwes and Mustafa Oweida. He added that the soldiers have abducted and detained 21 Palestinians since the shooting attack took place Sunday, allegedly for filming or showing support for the attack, in Sheikh Jarrah. Sbeih Abu Sbeih, the father of Misbah, the carried the attack out. Nasser Qous, the head of Jerusalem office of the Palestinian Prisoners Society. Omar’s brother (name not released). It is worth mentioning that the Hamas movement has claimed responsibility for the shooting attack, saying that it was carried out by one of its members. In addition, Israel managed to get Facebook to close Misbah’s personal account.